A good long soak in my claw foot tub helps me shake the winter blues when it decides to snow in March or April. I’ve enjoyed “me time” soaks ever since I was in high school, sometimes spending an hour in the bath or as long as I could keep the water warm. Magazines have always been my first choice of reading material for a long soak in the tub. Although it’s reaching 60 degrees today, it’s dropping below 40 next week, so I headed over to Target and picked up the latest copy of People® magazine and Real Simple® magazine. I’ll need these when I thaw my bones in my claw foot tub later this week. 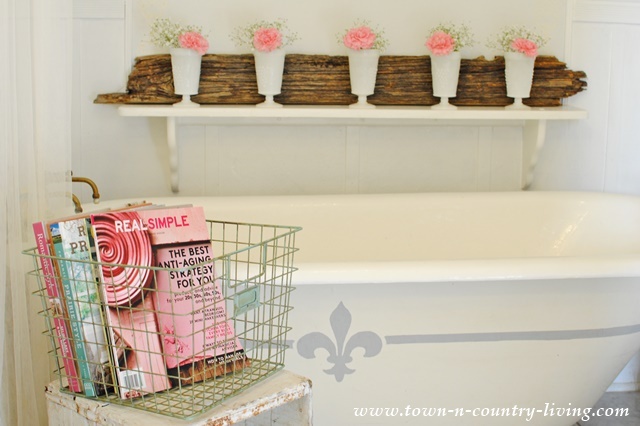 I have to confess … the pink cover of Real Simple® inspired me to add a touch of pink in my farmhouse bathroom. I removed everything from the shelf above the claw foot tub just to add a touch a pink! 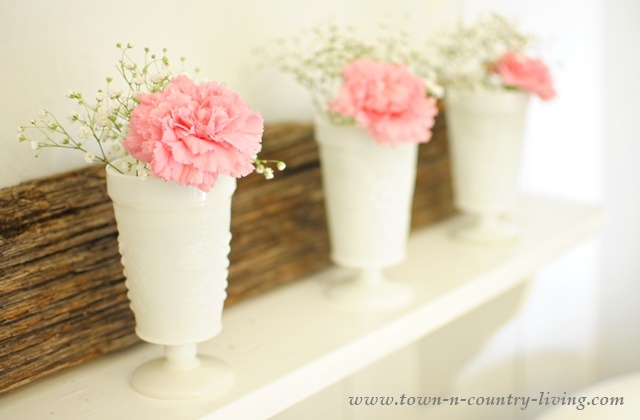 Sometimes I line this shelf with candles, but this time I added a row of milk glass tumblers filled with pink carnations and swigs of baby’s breath. My grandmother had tumblers exactly like this, which is why I snagged these a couple years ago at our local flea market. Speaking of my grandmother, this issue of People® magazine has an inspiring yet sad article on Alzheimer’s. My grandmother had Alzheimer’s and now my mother suffers from it. According to the article, new research and drug treatment is providing hope for those who might have it in the future. Here’s another spot in my farmhouse where I like to read and enjoy a little “me time” all by myself. Coincidentally, Real Simple® magazine has some great tips for improving the bedroom with lighting, bedding, and more. It’s inspired me to make a few simple changes in my under-the-eaves bedroom. When the spring season weather cooperates, this is my preferred spot for unwinding and staying sane. Whether I’m reading, enjoying a favorite beverage, or just listening to the birds sing … spending a little time on the front porch always lifts my spirit. 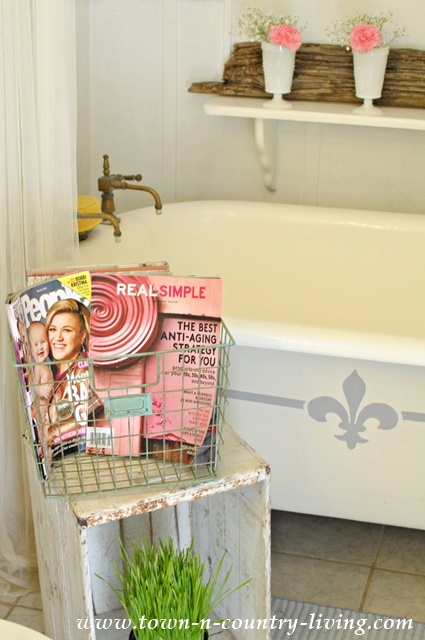 But for now, when the spring temps get a little cool, I’m perfectly content to stay sane with a luxurious soak in my farmhouse claw foot tub with a couple of good magazines! What do you do to pamper yourself and help you unthaw from winter as we head into spring? You can save $2.00 when you buy any TWO (2) participating magazines titles (All You®, Real Simple®, PEOPLE®) from 3/15-3/28 while supplies last. 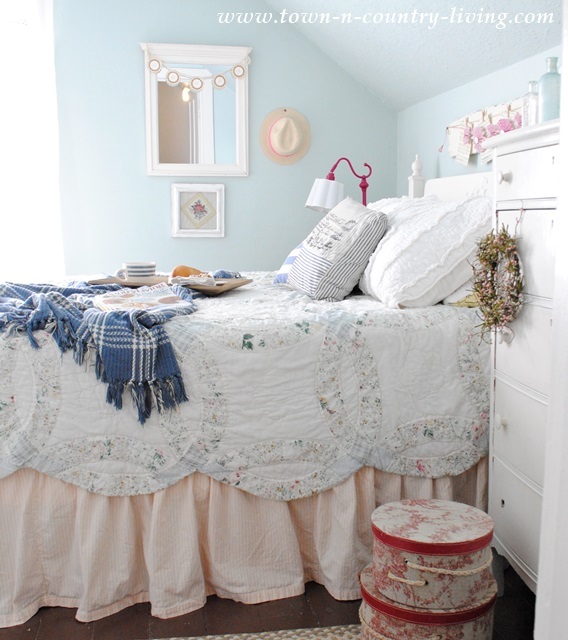 This is such a pretty post with the pink flowers, your gorgeous tub, and charming bedroom. I always keep a stack of magazines around for inspiration, I even flip through the really old ones sometimes. We have crazy yo yo Spring weather here in Virginia too. I don’t mind as long as the snow stays away! 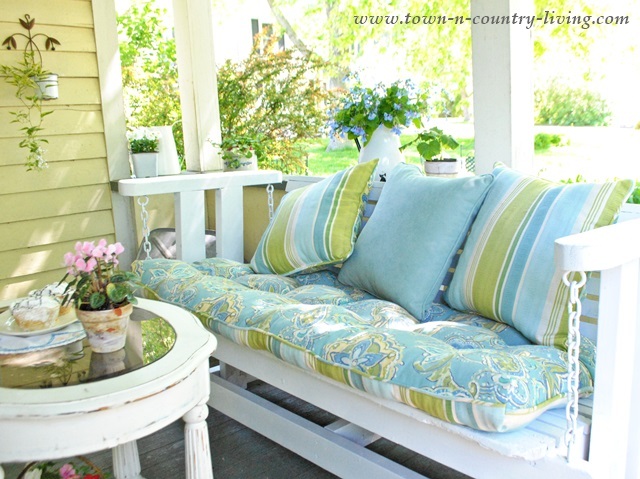 Love your porch swing! The cushions are so pretty. Everything looks so lovely. I love your milk glass with pink carnations and baby’s breath. I have always loved carnations. When I found your blog I saw your front porch and fell in love with it. The colours are so welcoming and I am sure you feel at peace sitting there. I love to be outside. I will even sit in my heavy coat just to smell the air, feel the sunshine on my face and talk to our cats. The porch is a wonderful place. I am looking forward to decorating our new porch and making it an oasis for the summer months. Have a great day! Jennifer, your first couple pictures of the tub had an optical illusion in them ! I kept seeing wooden hats on the shelf with flowers above them. I looked and looked, wondering why the hats on the end weren’t whole. 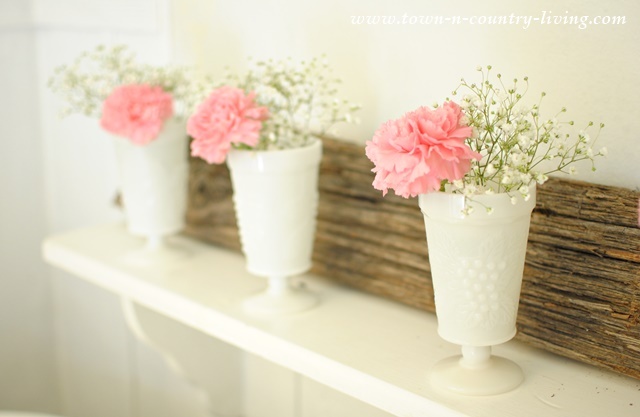 I finally realized from another photo that what I was seeing was white vases spread out with a piece of wood behind it ! With white all around the vases, it just looked like voids, not vases. A lovely room for a lovely long soak ! Ha ha!! Too funny, Patty. I never even noticed it but now that’s all I see is hats on the shelf. LOL. I saw hats too!! Glad I’m not the only one!! 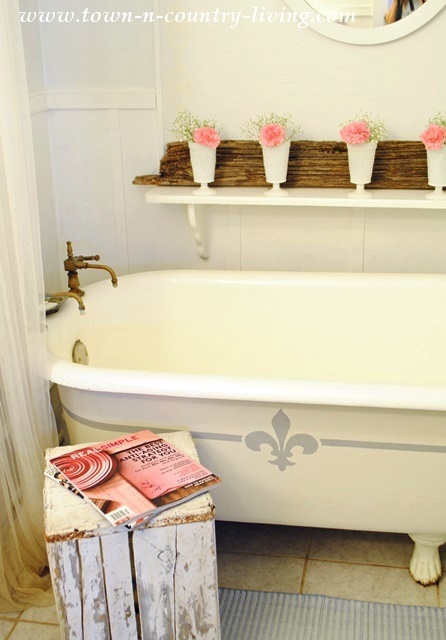 Love your tub area……..I also take long soaks to restore my spirit and follow it up with good lotion, makes me feel so pampered and special so I don’t care about the weather!!! I understand the need for a soak in the tub, and as the sole caregiver for my 94 year old Mum, my time in the tub, on my porch in the sun listening to the birdies and enjoying my yard is the best medicine. Unfortunately, everything is still covered with snow here in New England. I’m headed out to get the new People Magazine to read the article on Alzeheimer’s. Lost my Dad to it 21 years ago. It’s reassuring to know they are making progress in treating and hopefully preventing the disease. Love your blog, and enjoy see the pictures of your beautifully decorated home! Your bathroom & tub ,and well- EVERYTHINGGGGG is so perfect! It’s bright, creative & so cute! !